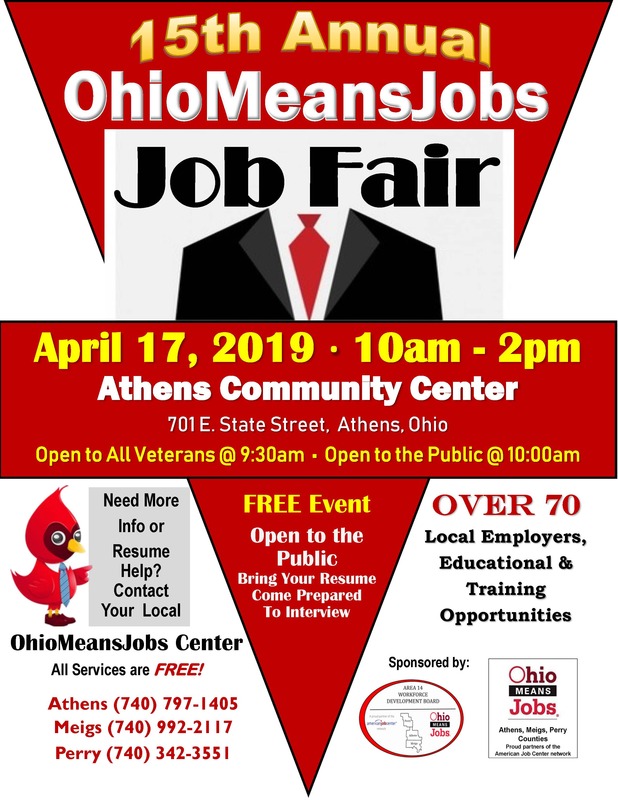 The 15th Annual OhioMeansJobs – Job Fair will be held, Wednesday, April 17th, 10am – 2pm, at the Athens Community Center, 701 E. State Street, Athens, OH. The event is FREE and open to the public. The job fair will feature over 70 local and regional employers, educational & training opportunities and apprenticeship programs! Bring your resume and come dressed to interview! Employers interested in participating should contact the OhioMeansJobs – Athens County at (740) 797-1405 to reserve a table. Set-up for the event will begin at 8:30am. Employers are invited to participate in the OhioMeansJobs Info Session beginning at 9am. The session will highlight all of the free employer services available at your local OhioMeansJobs center. Free lunch will be provided for all employers. ** A limited number of computers and printer access will be provided on site for job seekers and employers. The 15th Annual OhioMeansJobs – Job Fair is sponsored by: Area 14 Workforce Development Board, and the OhioMeansJobs Centers of Athens, Meigs and Perry Counties.